About six and a half years ago on August 6, 2012, I got up early to watch NASA TV as they broadcast the landing of the Curiosity Rover on Mars. I remember the significant tension of this particular landing because NASA was employing some new technology that had never been used before. They used the usual heat-shield to brake through the upper atmosphere, then deployed parachutes to slow the lander even more. But, what was novel about this landing was the use of a “sky crane” which NASA engineers dubbed, "seven minutes of terror." The Curiosity Rover was much heavier than other craft that had been landed on Mars and so the usual airbag crash would not protect the heavy rover well enough. The sky crane was a rocket-powered descent device that separated itself from the Curiosity Rover with a bridle of three cables and an umbilical cord which allowed the sky crane and rover to communicate with each other. After separating from the rover but remaining attached by the cables, the sky crane fired its rockets to allow for a gentle descent to the surface. Once the rover was gently landed on the ground of Mars, Curiosity communicated this via the umbilical cord so that the sky crane could cut the cables and fly far away to crash elsewhere on the surface of Mars. Won’t humans one day have fun when we finally do travel to Mars and see the various landing and crash sites of such vehicles as the sky crane, Mars 2 (a Russian craft that crashed hard on Mars and did not respond to calls from earth), Viking 1 and Viking 2 (NASA landers that did manage to send back data to earth), Mars Polar Lander (a failed NASA lander), and Spirit (active from 2004 to 2010) and Opportunity Rovers (active 2004 to 2018 when a dust storm forced it into hibernation) two more successful NASA landings? 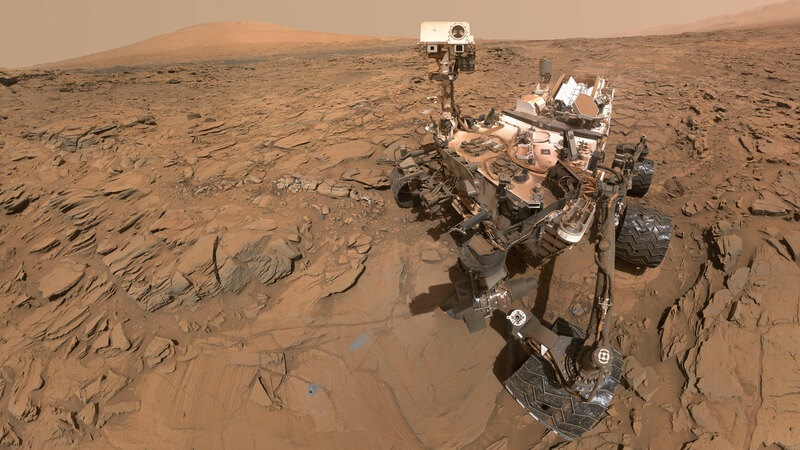 What I find amazing is that the Curiosity Rover that I sat watching as it landed in 2012 is still active on the planet, roving over the surface and doing science. And of course, Opportunity Rover holds the record so far for the longest rover mission on the Red Planet. These technological feats of engineering stagger the mind. Once a rover has successfully landed on Mars it must then survive dust-storms that foul moving parts and cloud over solar power systems. Yet these rovers grind on in the cold. The average temperature on the planet is estimated to be around −63 °C, with highs of 20 °C and lows near −153 °C. To be sure, it is not a very hospitable place for a rover. Yet NASA and other space agencies continue to plan more missions to Mars. Hope Mars 2020 is a United Arab Emirates launch scheduled for July of 2020, Mars 2020 Rover, a NASA venture, will collect samples that will be returned to earth by a later vehicle, and the Exo-Mars Rover 2020 which is a joint effort of the European Space Agency and the Russian Roscosmos Agency, will also land in 2020. Japan and China also currently have plans to land landers in 2020 and the Indian Space Research Organization plans to land on Mars in 2022. It seems that all of the nations of the world are involved in this space-race to begin the process of colonizing Mars. NASA, in collaboration with SpaceX and other private space companies have plans to put humans on Mars by 2033. Other countries around the world are making their own target dates for when they anticipate landing humans on Mars. In the 15 years from 2020 to 2035, what will this kind of competition and cooperation look like? Will this contribute to world peace or add fuel to many world-wide conflicts. Let us pray that the space race may truly be used to satisfy human curiosity rather than human greed. Here's to many more years of Curiosity!